This article was published in indiatogether.org, with the support of Oorvani Foundation – community-funded media for the new India. After the disastrous floods and landslides in Jammu and Kashmir in September 2014, who was eligible for relief and compensation from the government? How would people apply for it, and what were the details of the relief packages? And who actually obtained these benefits? 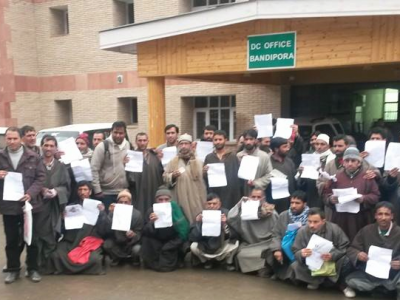 Citizens of Bandipora file RTI applications to obtain records of government flood relief distribution. People of Bandipora district decided to find out. And the district collector complied, posting the information on the notice board and on the official website: Bandipore Dstrict Flood Relief Details. So simple? Not quite. Since the flood relief phase of October-December, people had asked several times for information on the surveys, criteria for selection of beneficiaries and reasons for discrimination in compensation. Some sustained severe damages and got Rs. 3000 compensation while people with pakka houses and little damage got Rs. 73,000. What was the rhyme or reason for this? 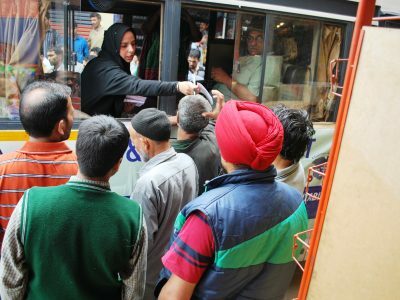 After volunteers of the JK RTI movement organized the flood-affected people and oriented them in the use of the Right to Information act, the citizens got together and on February 24, filed 200 applications for information. On the very next day, the information came into the public domain. This RTI success story has a background of village-to-village grassroots level work by people of Jammu and Kashmir over the past year, building on similar efforts throughout the country, particularly in Gujarat, the base of Mahiti Adhikar Gujarat Pahel. Initiated in 2002 and associated with the National Campaign for People’s Right to Information, MAGP is a program of Janpath, a network of voluntary organizations in Gujarat working on issues of strengthening people’s voices in natural resource management, organizing of Nomadic and primitive communities, and supporting human rights defenders. With the support of Janpath and the Association for India’s Development, MAGP outfitted a bus to serve as an RTI-on-wheels training and resource center that travelled first throughout Gujarat starting in 2007, then gradually to neighboring districts and states and then flagged off an RTI Bharat Yatra throughout India in 2014. Reaching urban and rural areas and remote villages the RTI van serves a site for volunteers to talk to people about their right to information and their right to a government that works for them. 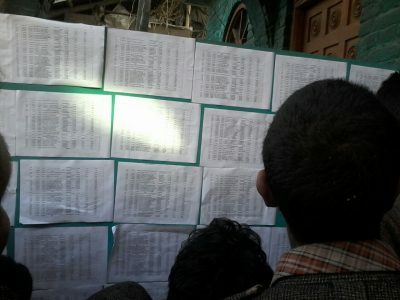 Citizens examine flood relief records released by the District Collector in response to their RTI applications. At a group meeting with flood survivors, RTI team member Anjan Bilal explains the RTI Act to flood affected people in Jammu. Student volunteer Aliya Bhat hands out pamphlets at the RTI-on-Wheels halt in Kupwara. Cruising through Kashmir on the RTI-on-Wheels Bharat Yatra! RTI Team raises a fist in Solidarity. 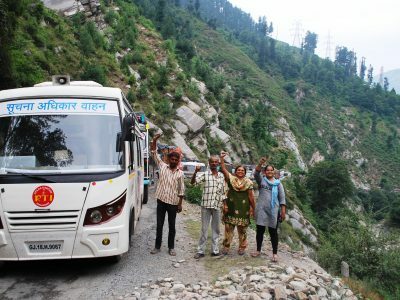 In June 2014, the RTI-on-Wheels bus yatra reached Jammu and Kashmir and inspired young and old alike to take to heart the message of participatory democracy and accountable governance. Sadhna behn, a trainer on the bus said, “ “While some people knew about RTI, they still felt that being villagers it would be difficult to challenge the powerful people if they chose to withhold the information.” Consider Nisar Ahmad from Thathari. People in his village had not been paid for their work in the MGNREGA program and he suspected corruption. He asked the block development officer for copies of the muster rolls and expenses and was charged Rs. 5000 for the photocopy charges. Four months later, still waiting for the Public Information Officer at the BDO office to send him the information, he heard about the RTI Bharat Yatra reaching the Chenab region. Travelling 23 kilometres to Doda he attended the RTI users’ meet on 17th June. Sadhana behn guided him in filing a complaint with state information commission under section 15 of JK RTI Act (2009). The Commission ordered the PIO to furnish the information and refund the Rs. 5000 that Ahmad had paid. Cross-checking the government records with the villagers at the grassroots, he found that there were fake names and other irregularities. The people then collected evidence to file complaints with the government and recover their lost wages. In June and July, the RTI-on-Wheels Bharat Yatra visited Jammu, Doda, Kishtawar, Anantnag, Srinagar, Kupwara, Pulwama, Shopian, and Badgam. Pankti Jog, coordinator of Mahiti Adhikar Gujarat Pahel, explained how they approached people during the yatra: “In public markets, bus stands, schools and colleges and outside of masjids just after Namaz, the team held outreach and awareness programs about the Right to Information Act and how people could use it to solve their problems. As a follow-up of the campaign, the JK RTI team started an activity center in the flood-affected areas of Nowgam and Bandipora. As their efforts in the flood and landslide-affected districts throughout the monsoon and winter shows, neither rain nor snow nor gloom of night keeps the RTI bus from rolling and delivering information into the hands of people who can use it to make the government work. And the first success to come out of Bandipora is the release of the flood relief records. 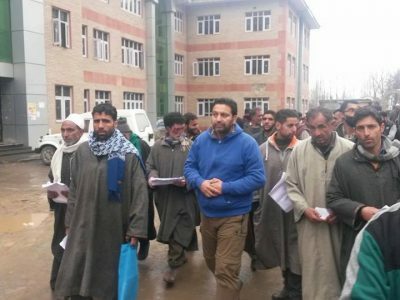 Dr Shaikh Ghulam Rasool leads a group of RTI users to file RTI en masse at the District Collector’s office in Bandipora. Information is just the beginning. 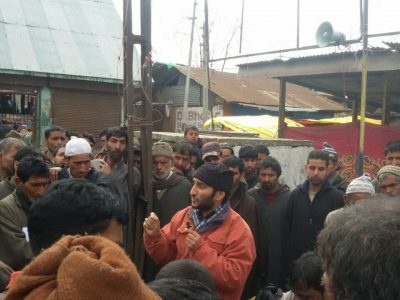 Now armed with the names and figures, the people of Bandipora will be invited to a public hearing to cross-check the lists and ensure that the benefits have actually reached the people, and bring any discrepancies to the notice of the government for further action. Trained and supported by Janpath and its pathbreaking team of RTI activists, the local organization JK Rural Voice has been steadfastly working in villages and districts throughout the state and teaching people how to obtain information on government policies, processes, approvals and expenditures in order to solve their problems at the individual and social level. 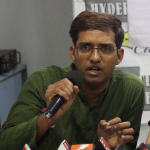 Harinesh Pandya and the RTI on-Wheels team are planning to return to Jammu and Kashmir at the end of March. AID has supported Janpath’s work including the RTI-on-Wheels bus and yatra in Gujarat, Jammu and Kahsmir, and throughout India since 2007. 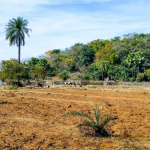 The bus most recently halted at the Gir Lion Sanctuary, interacting with the Siddi Badshah community and plans to return to Jammu & Kashmir at the end of March.